Tentacool in game: 5,910 Who? Important notice! Pokemon Tentacool is a fictional character of humans. 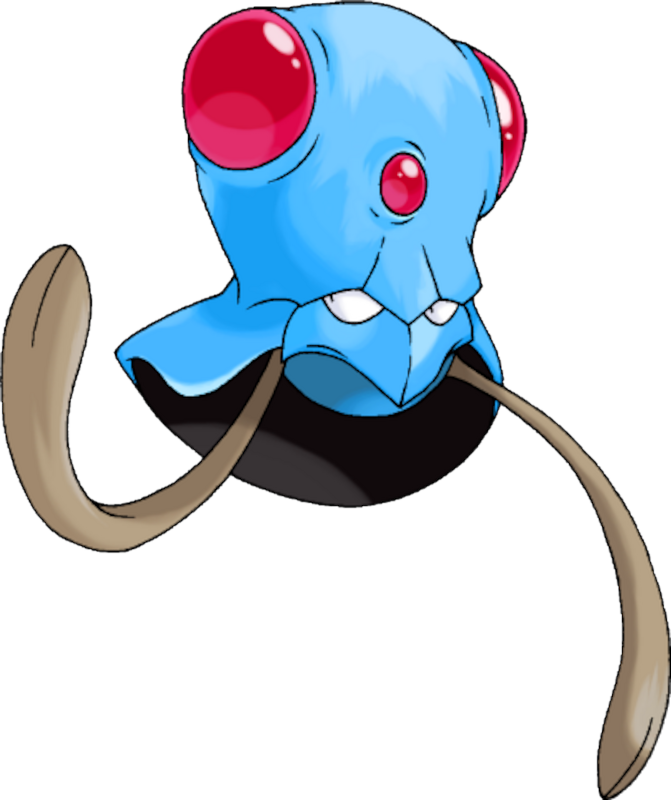 Tentacool resembles a box jellyfish. It has a light blue, clear body with two large, transparent, red crystals on each side of its body, and one small one in the middle. It has two small eyes with black pupils and no visible irises near the base of its body. It has two tentacles laced with stinging cells. The tentacles extend from beneath its round, blue lower body, which has a cape-like formation in the back. 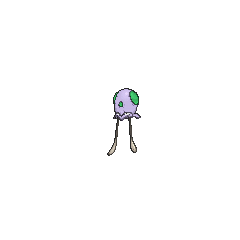 Tentacool absorbs sunlight and refracts it using water inside its body to convert it into beam energy, as seen in the anime. It is also able to control Pokémon it touches with its tentacles. Tentacool can be found throughout the ocean. It will sometimes wash ashore and become shriveled and dehydrated, but may be revived if it is thrown back into the ocean. 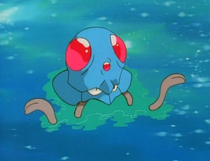 Tentacool's debut appearance was in the episode Tentacool and Tentacruel. A Tentacool appeared in Friends to the End during Ritchie and Assunta's battle. However, it is unknown who it belonged to. In the same episode, another Trainer's Tentacool appeared during the closing ceremonies of the Indigo Plateau Conference. Multiple Tentacool appeared in Bye Bye Psyduck, The Power of One, Destiny Deoxys and Diancie and the Cocoon of Destruction. A Trainer used a Tentacool in Hook, Line, and Stinker to aid him in the annual Seaking Catching Competition. A Tentacool also appeared in Celebi: Voice of the Forest. Two Tentacool appeared in Mantine Overboard!. A Tentacool was seen at a Pokémon Center in The Legend of Thunder!. A Tentacool appeared in the opening of Pokémon Heroes: Latios & Latias. 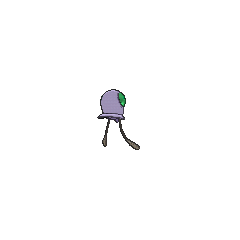 Also, a Tentacool was used by a competitor in the Tour de Alto Mare. A school of Tentacool appeared in a flashback in A Cacturne for the Worse. May fears them due to being surrounded by them at one point, and her mother attempted to catch her, thinking that she was a Tentacool. A Tentacool appeared in the opening of Lucario and the Mystery of Mew. Two Tentacool appeared in Going for the Gold!. A Tentacool appeared in a flashback/fantasy in Day Three Blockbusters!. Tentacool's first appearance is a cameo in Bulbasaur, Come Home! as one of the Pokémon that escapes from Professor Oak's Laboratory. In What a Dragonite multiple wild Tentacool were escaping from a Dragonite. In The Kindest Tentacruel a herd of Tentacool appeared along with a Tentacruel where a baby Tentacool got its tentacle stuck under a boulder where it later helped rescue Yellow. One of the members of the Pokémon Fan Club in Vermilion City apparently bathes with her Tentacool on a regular basis. She is seen again with her Tentacool in The Last Battle XIII during the Chairman's call out to all Trainers to send their Pokémon to help the fight in Ilex Forest. 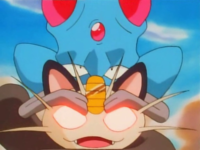 In The Final Battle V, during the Trick Master's story of the homeland soil, a Tentacool appeared in the flashback when it was one of the Pokémon calmed down by it. 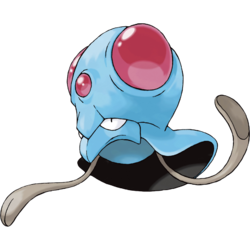 Tentacool is based on a jellyfish, possibly a species of box jellyfish such as Chironex fleckeri or Carukia barnesi.